Or, I can't think of a more concise way to say let's generate a custom idea where we take turns contributing one marking at a time! This is meant to be a chain where we all slowly contribute to the same custom totem pet and gradually fill all its markings in. 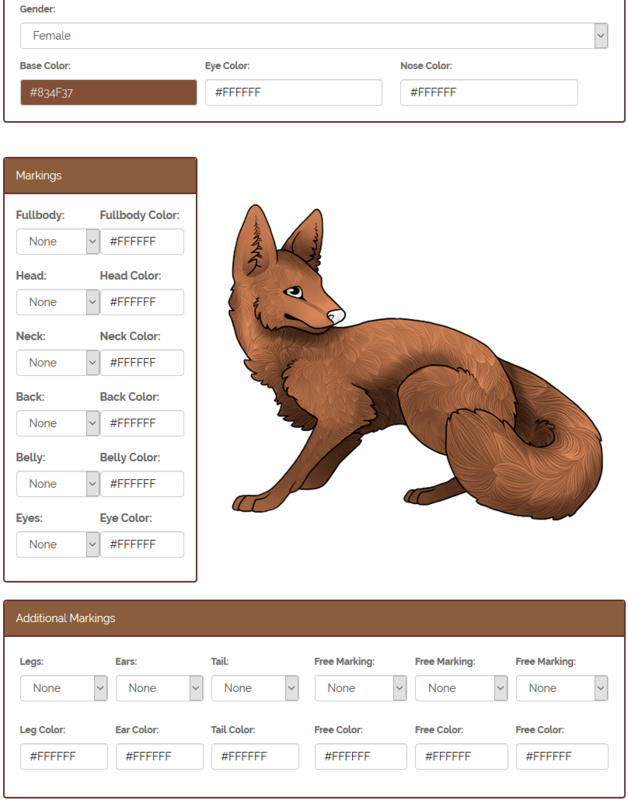 To contribute, take the custom idea from the post directly above you and input the exact same markings and color hex codes into the Pet Demo. Then, put a new marking of your choice into one of the currently empty marking slots (or change the base, eye, or nose color if they haven't already been set by someone else). It's most convenient if you can take a screenshot of how the demo looks with your new addition and post that into the thread, but if you can't do that, post the new marking and hex color and I'll fill it in myself and post your image for you. Even if you have the image, it would be very helpful if you could post the current list of markings and their hex color numbers so other players can copy and paste them. There's no accounting for taste; feel free to add a wacky color or something wildly mismatched with the current markings. Seeing how others will respond is half the fun! You cannot change the marking type or color of any marking already added by another player. If the base, eye, or nose colors have been set by another player, you also cannot change those. When all slots are filled in, we'll start a new custom! Any marking is fine, including uncommon and rare ones! Try to post a screenshot of the demo if you can, but definitely include your new marking and its hex color code so I can upload an image for you. It would be helpful to include a list of all the current markings and hex colors so the next player can copy and paste them. Discussion, feedback, and suggestions are welcome in this thread. When we finish a pet (so all marking slots are full and the base, eye, and nose colors have been set), I'll hold a giveaway with a random winner for a copy of the custom we created using my own totem. I'll ping everyone who participated to see if they want to be in the drawing. Everyone will get 1 ticket in the drawing regardless of how many markings they added. I'm fine with the winner making minor adjustments to the custom such as darkening a color or removing a marking, but it should look essentially like the same pet that we finished in this thread. I love this custom, can I make it with my own totem? I'll start us off with a new Fox! What an interesting idea. One marking or colour change at a time? @Antimoany I actually intended for people to pick the marking color when they first picked the marking too! I debated for a while - I feel like only picking the marking OR a color of an existing marking is more in the spirit of the game, but the latter gives a bit more ownership of the marking, plus the forums here can be pretty slow. ^^; I flipped a coin to decide, so if you think the former would be more fun, I'm happy to try that out first and see if rules should adjust for the second run. Otherwise, would you want to modify your post with a color for the merle? @GrayEmbers On reflection, I think picking both marking and colour at once makes more sense! Otherwise it just drags things out. Maybe we could try the other version later on if this thread is more successful? For now, I've edited my post with a colour.